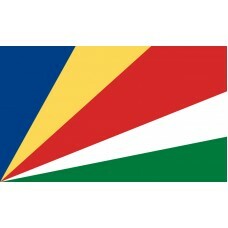 The Seychelles Flag features five oblique bands that go from the bottom end of the flag to the top end in the colors of green, white, red, yellow, and blue. These colors are the colors that are used by the nation's two major political parties which are, Seychelles People's United Party and Seychelles Democratic Party. The lines represent the new country that is progressing into the future. The blue color represents the sky and the sea that surrounds the Seychelles, the yellow color represents the sun and light as well as life, the red color represents the people of the country and their determination for unity and love of the country, the white color represents justice and harmony, and the green color represents the country's land and environment. The Seychelles flag was adopted on January 8th, 1996 and since gaining independence in 1976, the current flag is the 3rd flag that has been used. The first flag that was used since gaining independence was a flag that featured alternating blue and red triangles. In 1977, after the President was overthrown the old flag was removed and a red, white, and green flag was introduced that was based on the flag of the Seychelles People's United Party. The Seychelles is an island country that is located in the Indian Ocean on the African continent. It was named after Jean Moreau de Sechelles, who was King Louis XV minister of finance. It is a country that consists of approximately 155 islands (the majority of them are uninhabited). The capital of the Seychelles is called Victoria and is the smallest capital in the world. The largest island is called Mahe, and the island of Praslin is the second largest. The Seychelles has two regions that are known as, "The Granitic Islands" and the "Coral Islands." These are the world's only islands that are formed of granite rock and they are also the world's oldest ocean islands. For thousands of years, the islands were uninhabited and the first sighting of them happened in 1502 by the Admiral Vasco Da Gama. The first people who arrived on the island were Captain Alexander Sharpeigh's crew, known as the "The Ascension" who arrived during their fourth voyage of British East India Company. In 1756, the French began to take control of the island when a "stone of possession" was laid on the island of Mahe by Captain Nicholas Morphey. In 1794, the British took control of the islands when Jean Baptiste Queaue Quincy negotiated the country's status and eventually they gained full control in 1810. In 1976, Seychelles gained independence as a Republic. The Seychelles economy is mainly reliant on tourism and fishing. It has become a very popular tourist destination with many attractions on the various islands. The island of Praslin is very popular amongst tourists due to the beaches, Bird Island is home to the heaviest living tortoise in the wild and Moyenne Island is believed to have buried treasure but is also believed to be haunted, which is why no one approaches it.